Last month, we cover the most effective ways to get rid of unwanted pet hair on all sorts of fabrics and apparel. This month, we want to discuss 3 full-proof methods for removing stains from your favorite clothes, as well as, curtains, tablecloths, place mats, rugs, and more! Continue reading to get started! Spills and stains are bound to happen everywhere they can. Anything made of cloth or other form of textile are prone to permanent, unpleasant staining. In order to prevent stains from setting in, it is important to take immediate action when a spill or smudge occurs. More importantly, you must take good care of your fabrics for optimal stain resistance, and to maintain dazzling luster for as long as possible. Clothes, uniforms, costumes, rugs, mats, upholstered furniture, and curtains are most susceptible to stains like blood, grease, makeup, coffee, mud, paint, wine, vomit, gum, food and more. All of these stains can be extremely difficult to remove if left ignored or untreated. So they key to resolving a stain is to act immediately. When a spill or stain happens, immediately blot up any excess liquid or substance using a terrycloth towel or rag. Never wipe, rub, or smear in a blemish! Start from the outside and blot in a circular motion, working your way inwards. Take note that tougher stains, or ones that had time to set-in, will usually require professional treatment. The first remedy for stains is dry cleaning solvents. Brands like Carbona® and Energine® are examples of dry-cleaning solvents on the market, and come highly recommended by professionals. Just be sure to always read the label before attempting to treat a spot or stain with a dry cleaning detergent you are not familiar with. Also, it is a good idea to pre-test a spot on the material you intend to clean beforehand, to ensure the product is safe and non-damaging. Use the cleaning and blotting tips above, removing any excess liquid, and allow to dry completely. Finish with multiple rinses of the detergent from the treated material. The second remedy involves using a type of protein enzyme laundry detergent, which is just a fancy way of describing common cleaners like Tide® or Era®. 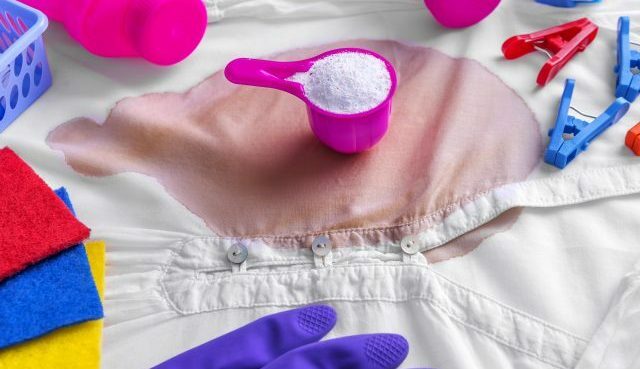 Not just for clothes, protein enzyme laundry detergents can also be used to treat stains on carpeting, rugs, curtains, and upholstered furniture, and more. Take note that you must dilute the detergent down by using only 1 part detergent and 30 parts water. This ratio is important so that you do not create uncontrollable lather and suds on your material. Use the cleaning and blotting tips mentioned before, then rinse the treated area thoroughly until the detergent is entirely gone. Multiple applications might be necessary depending on the severity of the stain. The third remedy for stain removal is to use two common household products: distilled white vinegar and rubbing alcohol. Combine 1 part distilled white vinegar with 9 parts rubbing alcohol. Ethyl, denatured, or isopropyl are acceptable forms of rubbing alcohol. Simply apply the mixture to the affected area, followed by the above-mentioned cleaning and blotting techniques. You may need to repeat these steps for best results. 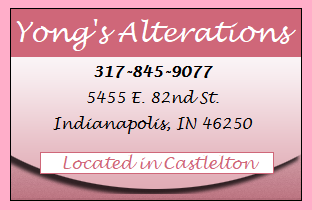 Call Yong’s Alterations at 317-845-9077 for professional clothing alterations in Indianapolis, Indiana. Our veteran seamstresses and tailors provide a wide range of professional alterations for men, women, children, home décor, costumes, outerwear, and more! Call 317-845-9077 to request a free quote, today. This entry was posted in Fabrics, Indianapolis Alterations Shop and tagged clothing stains, Indianapolis clothing alterations, remove stains on clothes, stain removal remedies, stain removal tips, stains on carpet. Bookmark the permalink.